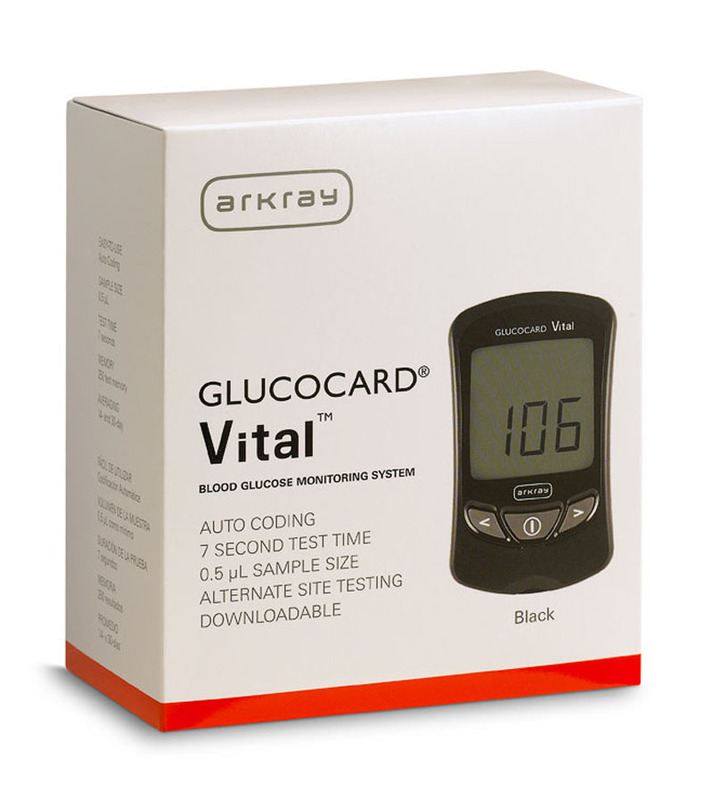 The GLUCOCARD Vital is everything a blood glucose meter should be – fast, accurate and easy to use. 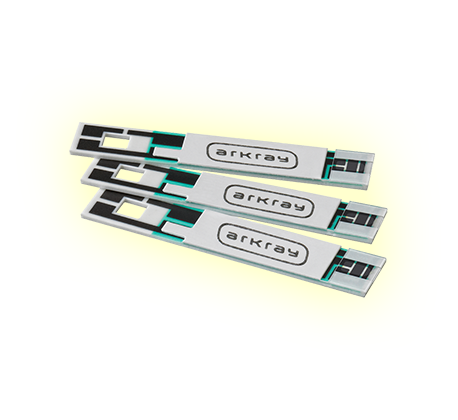 A small 0.5 µL sample size in our GO-based test strip platform gives accurate results in as little as 7 seconds. This auto coded meter has a 250-test memory, records 14- and 30-day averaging and is downloadable. What makes the GLUCOCARD Vital different from other systems? Every person who needs to monitor his/her blood glucose has individual preferences. That is why there are many options in the market. 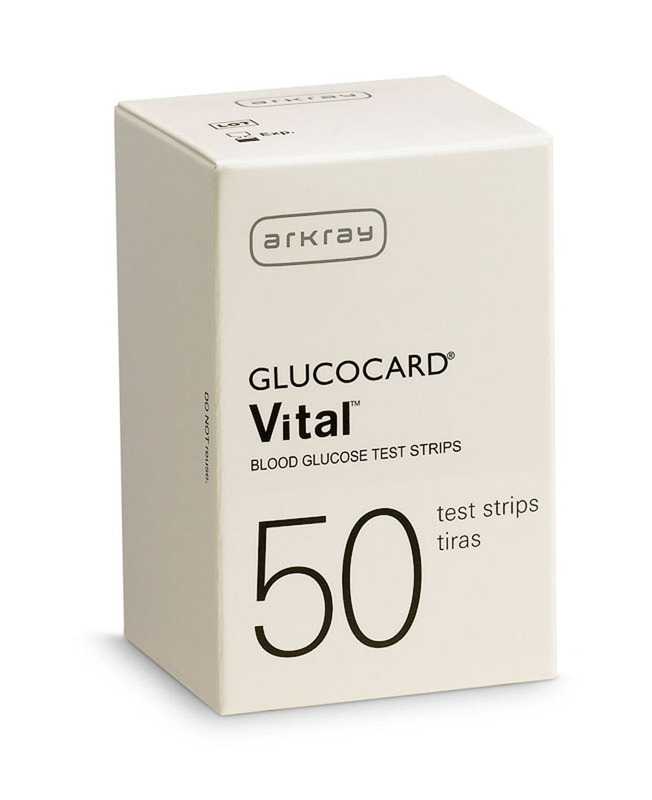 GLUCOCARD Vital features include Auto Coding, AST, 7 second test time, and 0.5 µL sample size. There is no need to physically code the GLUCOCARD Vital. Coding is accomplished simply by inserting a test strip into the meter - and the meter takes care of the rest! 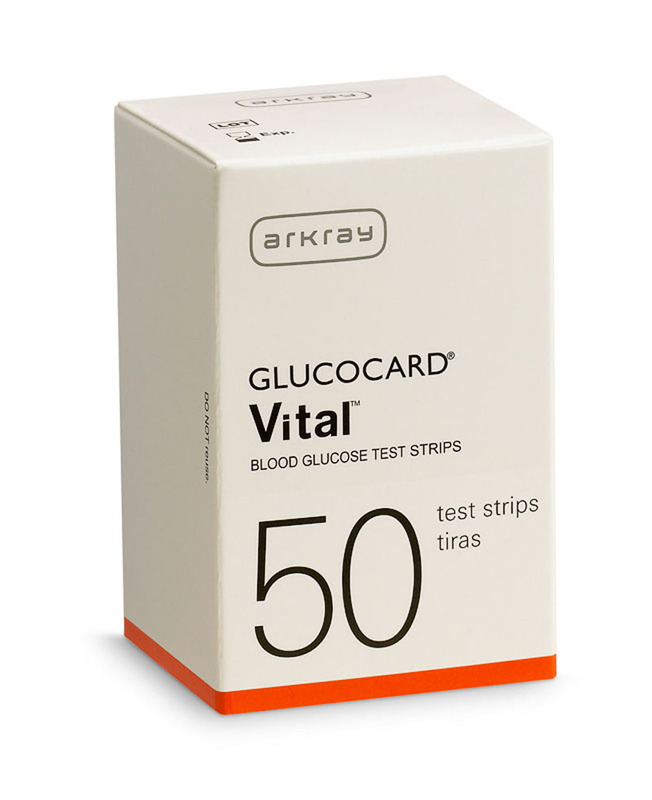 What is the sample size of the GLUCOCARD Vital? A 0.5 µL sample is required. The meter requires one 3V CR2032 battery. Generally, the battery should last approximately 2,000 tests at 4 tests per day. Do I need to reset the time after the batteries have been replaced? Touch the metal portion on the main unit with your fingers or any metal. Take over 30 seconds to replace battery. Insert a used or weak battery. What is the test strip open-life? Test strips good for up to 3-months after opening. Remember to write the date you opened the test strip bottle in the space provided. Can I use the GLUCOCARD Vital system if I am undergoing oxygen therapy? Is the GLUCOCARD Vital system affected by maltose and/or icodextrin? No, maltose and/or icodextrin do not affect the GLUCOCARD Vital system. 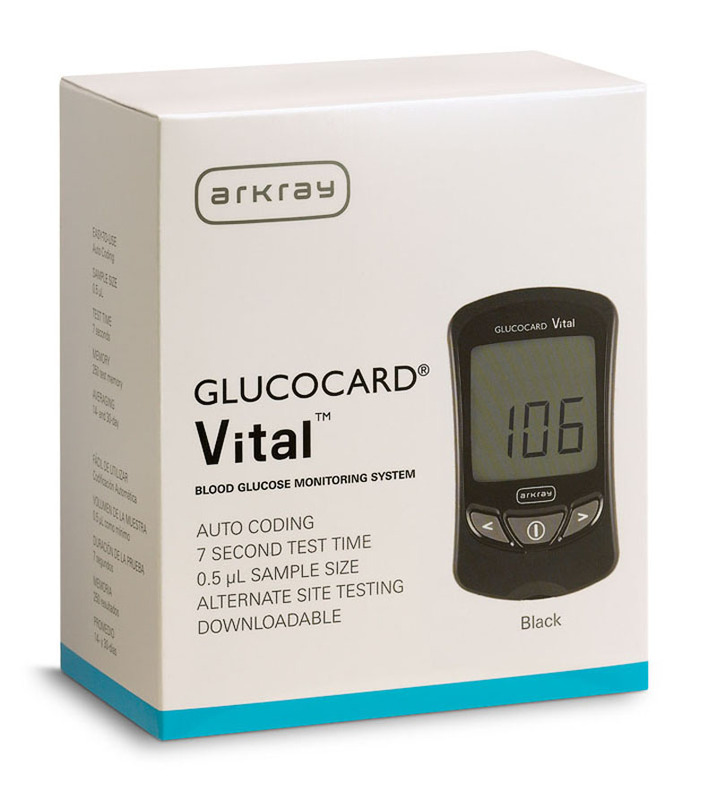 Does the GLUCOCARD Vital display test results in both mg/dL and mmol/L? 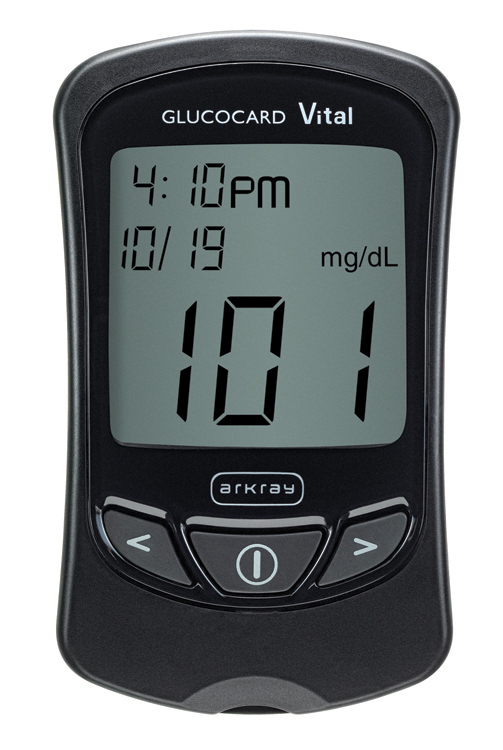 No, the GLUCOCARD Vital is programmed to display only mg/dL in the U.S.
Is the GLUCOCARD Vital Blood Glucose Meter whole blood or plasma referenced? GLUCOCARD Vital is plasma referenced. How do I clean the GLUCOCARD Vital and how often? Clean the outside of the meter with a damp cloth only. Dirt, dust, blood, control solution, or water entering the meter could cause damage. What type of lancet is included in the GLUCOCARD Vital Kit? The full meter kit contains a 28 gauge general purpose lancet.